If your pampered pooch is a member of the family, you need to check out this season's coolest pet costumes. Dressing your pet up for Halloween is a lot of fun for the entire family. Children delight when they see their favorite furry friends dressed as their favorite cartoon characters and adults find a posh, pampered, properly dressed pooch irresistible. So, if you haven't started to think about your pet's costume attire for Halloween '08, now is the time to do it. And to help you select the best costume for your pet, we've taken the liberty of compiling a list of our coolest, most recognizable, classic pet costumes. All of the pet costumes on our list are made of durable natural and synthetic materials that are comfortable and lightweight and they're available in small, medium, and large sizes to accommodate most dogs and cats. Really keep the season classic when you dress the family pet in our adorable Dogula Pet Costume. This insanely cute Dracula costume includes a black robe with attached collar and medallion. Designed to keep your pet comfortable, the Dogula costume is perfect for the classy pet with a thirst for adventure! 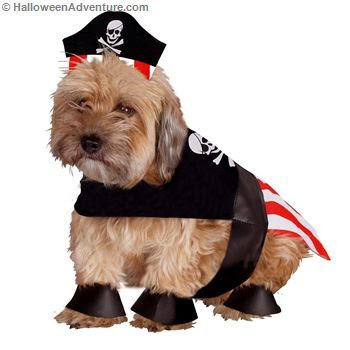 If your landlocked pooch loves water play, he needs the Pirate Dog Pet costume. This snazzily dressed swashbuckler is ready for high seas adventures in a big way! Complete with a skull and cross-bone robe, attached belt, a headpiece, and four paw covers, this one is sure to turn heads this Halloween! Stripes are in this season and your cute canine will look ultra-corrupt in our Prisoner Dog costume. This "bad" dog costume includes a comfortable, black and white striped jumpsuit with a matching hat. Perfect for the pooch who just can't stay out of trouble! 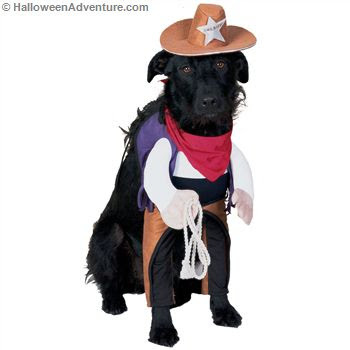 Keep a sense of law and order this Halloween when you dress your pet in our cool Sheriff Dog costume. Turn your pup into a peaceful defender with the sheriff jumpsuit, hat, and bandanna that accompanies this cool costume! Your dainty dog will blow everyone away this Halloween when you dress her in our ultra-adorable Wizard of Oz Dorothy pet costume. Relive the magic of one of the greatest movies ever made and pamper your pooch at the same time with this sensational dress and wig combo. So, get your camera ready and prepare to turn heads with your furry companions this season! Your pet will love the attention he gets and you'll love the memories that you and your family make with man's best friend. If you're looking for the perfect pet costume for your dog or cat, look no further than HalloweenAdventure.com. We carry an enormous selection of high quality, durable, and affordable pet costumes that are as impressive as any "people" costumes you'll see on the market this season. From superhero superdogs, to funny, but ferocious felines and everything in between, HalloweenAdventure.com is your one-stop-shop for your pet's perfect Halloween!